This name derives from the Medieval English 'be', itself deriving from the Olde English 'beo' meaning a bee and was originally given as a nickname to a busy and industrious worker, or an active person. 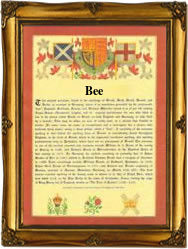 The bee has long been taken as a symbol of industry. The name is first recorded as a surname in the late 12th century as Be and le Boe. The spelling Bee appears in 1379 - 'Alicia Bee' the Poll Tax returns of Yorkshire. Other examples are Richard Bee, a witness at St. Dunstan church, Stepney on January 24th 1589 and Anne Bee who married Thopolis Leigh at Christchurch, Newgate on November 13th 1728. The first recorded spelling of the family name is shown to be that of Robert Be which was dated 1198 The Pipe Rolls of Yorkshire during the reign of King Richard 1 Richard the Lionheart 1189 - 99 Surnames became necessary when governments introduced personal taxation. In England this was known as Poll Tax. Throughout the centuries, surnames in every country have continued to "develop" often leading to astonishing variants of the original spelling.